Today five finalists are announced and voting is now open for the People’s Choice award. Dooring happens when a cyclist collides with a vehicle door that was unexpectedly opened in front of them. 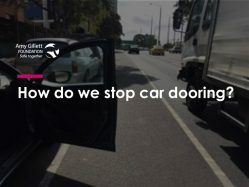 Car dooring occurs frequently in Melbourne. Research shows that on average a car door is opened in front of a commuter cyclist on their every second trip. Sometimes cyclists are able to avoid crashes by braking or swerving. When they cannot, the results can be catastrophic, leading to serious and sometimes fatal outcomes. In the decade from 2002 to 2012, one in ten cyclist injury crashes were the result of a driver or passenger opening a vehicle door. 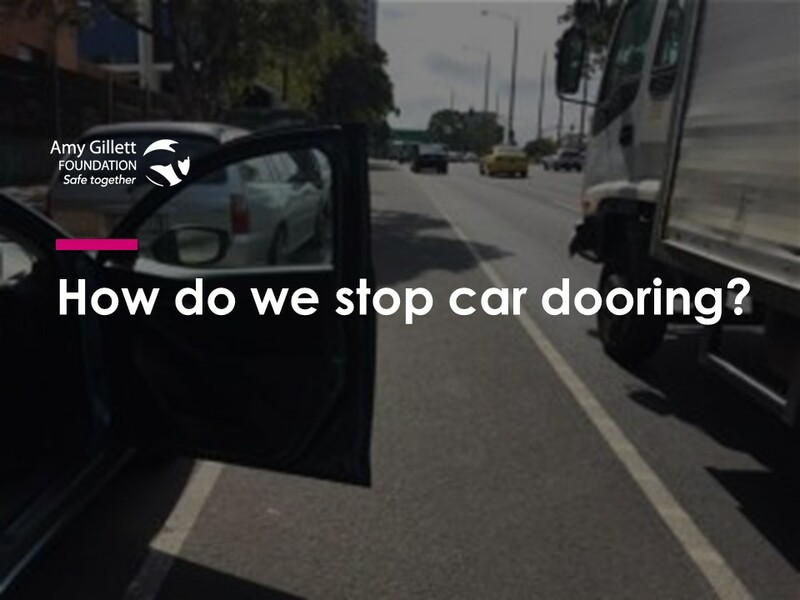 ‘Car dooring is a significant road safety issue. The risk is constant, pretty much every door a cyclist passes could be opened by a distracted driver or passenger’, said Phoebe Dunn, Amy Gillett Foundation CEO. As the days are getting longer and warmer, more people will be choosing to travel by bicycle. More people riding makes it even more important to increase awareness of opening doors safely. ‘We all need to check before we open our car doors, both when we are drivers and passengers. This is particularly important because so many of our bike lanes are painted next to parking bays. When you’re riding between parked cars and moving traffic, there’s nowhere to go. We all need to check before we open our car doors to make sure we don’t hit a cyclist’, said Dunn. The five finalists mix humour, magic, popular music, movies, vloggers and on-road footage in a range of creative and innovative videos designed to start conversations and raise awareness about cyclist safety. Go to amygillett.org.au to watch all the finalist entries and vote for your favourite. The finalists will be judged by a panel of road safety and communications experts at Symposium at the 2017 Australasian Road Safety Conference (ARSC) in Perth. The ARSC is the largest safety-dedicated conference in the Southern Hemisphere. This year’s conference theme is ‘Expanding Horizons’ and ARSC2017 is expected to attract over 600 delegates including researchers, policing and enforcement agencies, policymakers, educators and industry representatives. Winners of the People’s Choice award and the Best Creative Entry will be announced at the Australasian Road Safety Conference in Perth on Wednesday 11 October 2017 and on Amy Gillett Foundation socials after 5pm the same day.